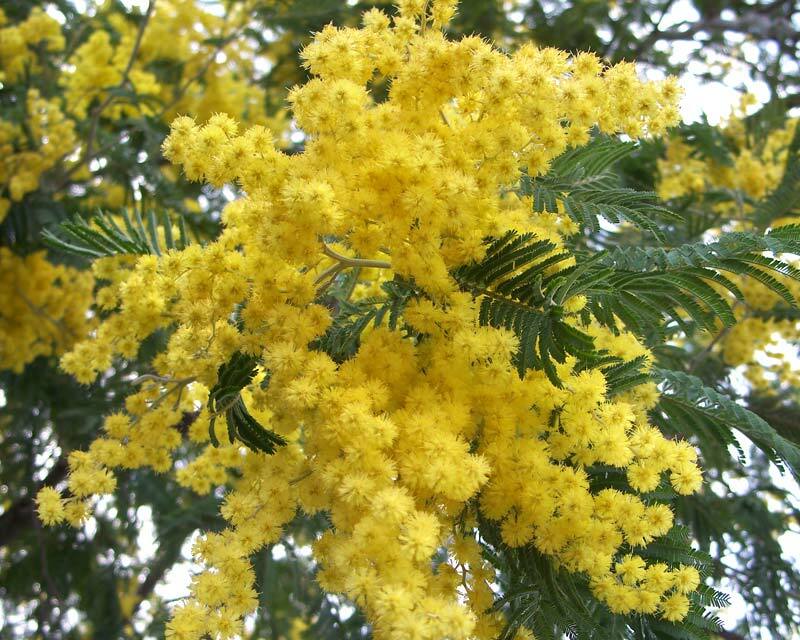 Acacia dealbata or the Silver Wattle is fast growing and has attractive evergreen, ferny foliage with the trunk and branches being very ornamental bluey green with contrasting areas. Even the seed pods are colourful - sealing wax red when ripe, and translucent seen against the sky. The scent is quite intense, but superb. The shoots are noticeably angular in section and bear true, bipinnate, blue green leaves. The highly fragrant flowers, arranged in large terminal racemes, are borne in spring. They are spherical clusters of bright yellow stamens approximately 6mm across. 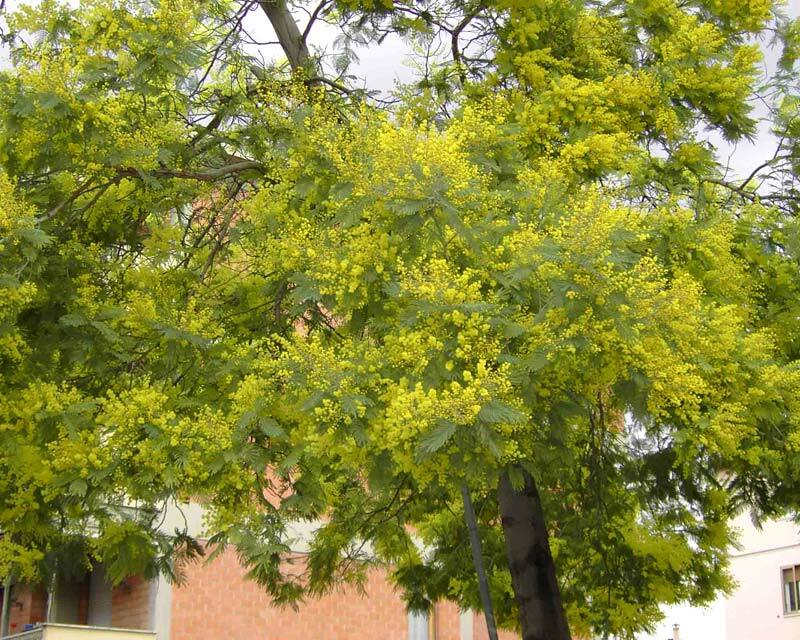 Acacia dealbata grows easily from seed, but the seed has a hard case and can lie dormant for 50 years or more. Usual technique for germination is to pour boiling water onto seed and allow to cool in the water before sowing. This usually results in a good germination even with very old seed. Soil: It prefers well-drained soil but doesn't need a lot of watering once established. 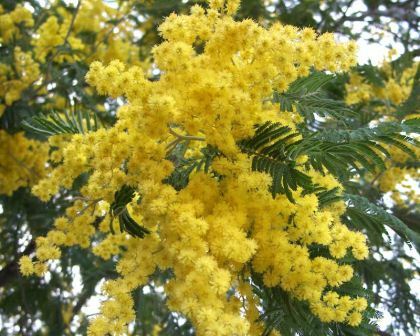 It is a good species to control soil erosion in country areas - but perhaps best well known as a garden specimen (where it is often called Mimosa). Maintenance: Water well during first summer, prune after flowering to keep tidy. Use low phosphorus fertiliser designed for native plants. 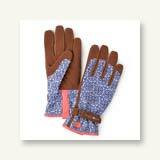 Other Species: 1300 species in the genus, A. floribunda, A.howitii are both popular amongst many others. 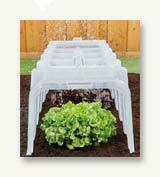 Plants for all garden styles, tastes and climates for shipping to East Coast destinations.